ECDPM continued to raise the bar in knowledge management and communications (KMC) activities. In 2012, we laid the foundation for a more targeted and dedicated KMC approach that underlines the Centre’s role as a strategic knowledge broker for well-informed policy dialogue. This year we invested in innovative communications tools, knowledge exchange platforms and information management facilities, while also strengthening our networks. We boosted our external communications in order to disseminate and promote the Centre’s work in a targeted, timely and effective manner. We supported the behind-the-scenes role of the Centre with strategic communications campaigns around key policy issues. At the same time, we aimed to increase the visibility of the Centre, which necessitated continuous attention to quality assurance in all our services and products. We stepped up our social media engagement in order to disseminate Centre work and engage more directly with stakeholders. The number of referrals to the Centre's website significantly increased, in part due to our concerted efforts to increase our numbers of ‘followers’ and promote our content in a strategic manner. We continued repackaging our expertise through our Talking Points blog. We also set up a blog on the future of Africa-EU relations with the objective of providing independent and comprehensive information in the lead-up to the April 2014 EU-Africa Summit. 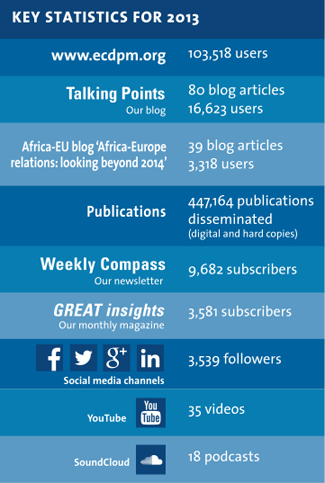 The blog featured regular contributions from African and European stakeholders. It raised the profile of our work on Africa-EU relations, strengthening our position as a leader in brokering partnerships between the EU and Africa. The Centre updated its corporate identity, both online and in print. GREAT insights, our flagship magazine, was redesigned from cover to cover for better readability and a more appealing look. Our social media outlets, too, received a modern and coherent appearance. We took a more creative and eye-catching approach to communicating data. We increased our use of infographics to highlight major research findings and refined visuals to present information in ways that draw readers in and guide them through complex policy issues. Multimedia materials were featured more prominently as an alternative way to inform policy processes. In 2013, we relaunched our news service The Filter. The site, now with an improved design and new features, continues to offer high-level information curation for busy policymakers. With it, we scan and summarise information from 500 resources on a daily basis. Another major focus during the year was building a new corporate website. We designed the new website with the objective of improving overall user experience. The site, launched in spring 2014, offers enhanced visual identity, better navigation, and improved presentation of content. Finally, we took a more dedicated approach to media relations. We strengthened our relationships with newspapers and online media such as The Guardian, Al Jazeera and the Financial Times's This is Africa. 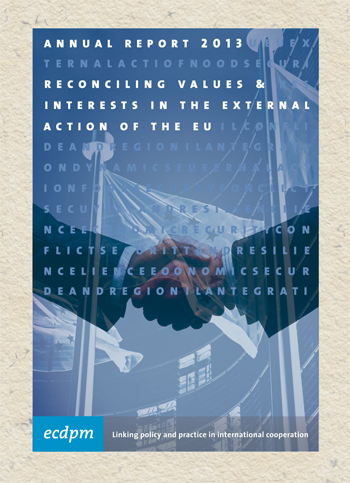 We set up a number of content shares and provided opinion pieces on ongoing policy discussions and upcoming events, such as the EU-Africa Summit. This new strategy led to a substantial rise in media mentions during the year. All these activities boosted the visibility of ECDPM’s work. As such, KMC activities contributed to achieving ECDPM’s aim of better informed policy debates. Our activities enabled the Centre to expand its geographical outreach, particularly in Africa. We continued improving our internal information, knowledge management and communication platforms, particularly through the Information and Knowledge Management Exchange (IMAKE) technology project launched in 2012. These platforms enabled the Centre to streamline organisational workflows and ensure sound management of information and knowledge. In 2012, we introduced Google Apps, Google Docs and Google Drive for the storage and management of documents and files. The adoption of cloud-based solutions enabled us to address longstanding problems with regard to information storage and retrieval by our highly mobile teams. It also opened the door for intensified knowledge generation, peer exchange and learning. In 2013, we made the full switch to a Google environment. All staff members received training and follow-up support to smooth the transition. To complement the existing Google tools, we introduced Google Sites. This platform facilitates knowledge sharing among ECDPM teams as well as with partners in the context of our broader networks. A last feature of the IMAKE project is its internal reporting and travel system. The benefits delivered by the project in such a short time have made the IMAKE name synonymous in-house with strategic vision in the digital domain and for successful change management. Besides the IMAKE project, ECDPM continued to strengthen its internal learning agenda through peer to peer exchanges within the Centre, and with colleagues in Europe, Africa and beyond. We expanded our knowledge management engagement with African institutions. In partnership with the Technical Centre for Agricultural and Rural Cooperation (CTA) and Co-Capacity, we facilitated a knowledge management workshop for Regional Economic Communities and the Planning and Coordinating Agency of NEPAD, the New Partnership for Africa's Development (NPCA). The aim of the workshop was to assess the current state of knowledge and information management within the Comprehensive Africa Agriculture Development Programme (CAADP). This was done in close cooperation with a range of continental and regional stakeholders. Similar workshops are planned for the future. Throughout the year we strengthened our networks in the knowledge management and communications field. These enable us to stay ahead of developments in this rapidly evolving field, and to jointly address challenges and promote innovation in the international development cooperation sector. With the Institute of Development Studies (IDS), we co-authored a series of articles on implementing communications strategies. The objective was to build the capacity of think tanks, especially in Africa and Latin America. The series is currently running on the On Think Tanks blog. We were also active contributors to WonkComms, a discussion forum for think tank communicators. We continued our participation as senior editor in the Knowledge Management for Development Journal and assisted in publishing several issues. In 2013, the journal moved to the Open Journal System, assuring public access to the articles. Finally, we established content-sharing agreements with Capacity4Dev, The Guardian’s development blog, The Broker, the Global Donor Platform for Rural Development, European Development Days, Inter-reéseaux, Hub Rural and Fondation Farm.